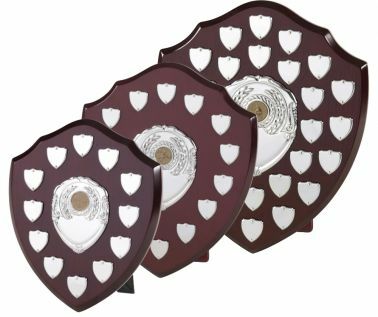 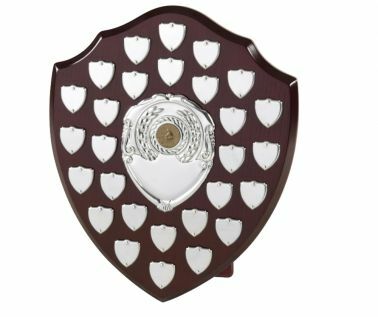 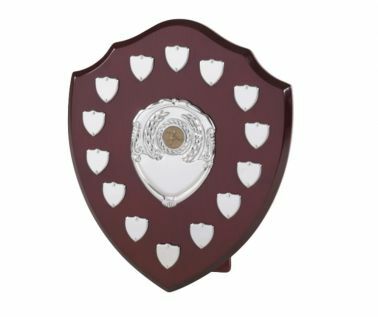 This traditional shield award is available in 4 different sizes and come with a minimum 12 areas for your perpetual winners names to be engraved, perfect for each month of the year!. It also has a centre area for the title of the award, and can also be personalised further by the changing of the centre of the shield, simply choose which is most appropriate for your event from our list below, if there is nothing to match your event type then choose the Victory Centre, as this is suitable for all events. It is either free-standing on its rear strut or can easily be wall mounted. While economical, these are very well made. 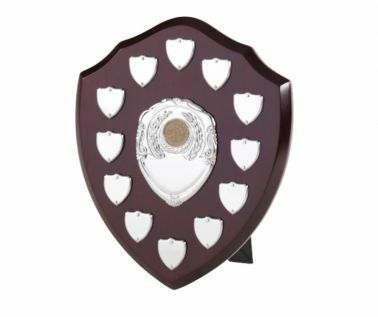 Last year we sold more shields than ever before, so this time we have designed many new variations of this really popular award. Our customers use them for a very wide variety of presentations; they are ideal for any repeated award.